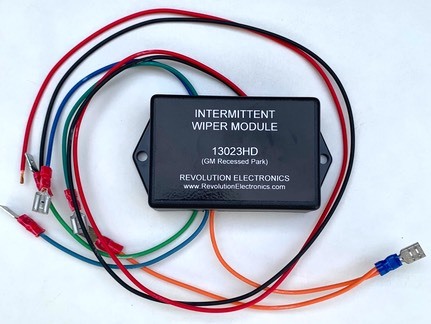 Upgrades classic GM vehicles with hiding wipers (see below) to include three intermittent wiper delays in addition to the stock slow and fast speed options. Designed to work with GM two-speed, hiding wipers through ‘77. Will not work with standard (non-recessed park) wiper motors. Note that the wipers will fully park between intermittent swipes (continuous slow and continuous fast settings work as normal). This module allows you to upgrade your 60's or early 70's GM car to include this feature. AND it does so while allowing you to keep your stock switch so the interior continues to look original. Works with the stock washer mechanism as well. Works with GM vehicles with the factory two-speed wiper switch and motor; and must be the "hiding" style. This module installs between the switch and harness. Three intermittent settings as well as the stock-slow and stock-fast settings become available. If you are unsure about what is meant by “hiding wipers”, it refers to a style of wipers that drop lower on the windshield when turned off. The wiper goes through its normal swipe across the windshield but when you turn them off, they go to the minimum-swipe position and then drop a couple inches lower. Often, this dropped them down lower than the top of the hood, so they were “hidden”. The GM term is “recessed park." Concerned you won't be able to figure out how to wire your switch? Check out our white paper on the various switches and their wiring (see here). Or, send it to us and we will figure it out for you! If you send us your switch and tell us what it is from, we will take the measurements and tell you which wire should attach where. This will allow us to build a database of switches and post them here on our site. Contact sales for more info. 3”x 2”x 1” plastic enclosure with mounting tabs. Three delay periods: one swipe every 8 seconds, once every 5, and once every 3. Note that the wipers will fully park between intermittent swipes (continuous slow and continuous fast speeds work as normal). 6 inch long, 18 gauge wires for connecting to the switch and harness. 24 inch long wires for power and ground.